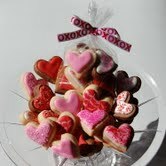 Valentine’s Day may be over, but you can give a heart sugar cookie anytime. I had fun trying a different technique of decorating – stencils! 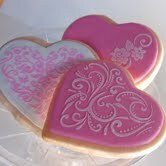 I was thrilled when I found these stencils made specifically for heart shaped sugar cookies. The stencil allows for you to get a lot of beautiful detail that is hard to do with just a bag of frosting and a decorating tip. Check out these heart sugar cookies that I did for Valentine’s Day. I had a hard time deciding which color combination I liked best on the sugar cookie – the pink and white or the red and white. The color combination possibilities are endless – that’s the great thing about decorating sugar cookies – you can do whatever color combination you want, and if you decide you don’t like it, just eat the sugar cookie and destroy the evidence. Failure never tasted so good! Because the heart sugar cookies were quite large (about 5-inches at the widest part), I decided to make some bite size heart cookies. That was a great move, but at the same time not so smart because it was too easy to eat the small sugar cookie hearts like popcorn. Have you ever eaten a dozen sugar cookies in one sitting? Well, I can now say I have – before you know it you will have eaten 12 of those bite size cookies. Designer sugar cookies are finally here in St. George. 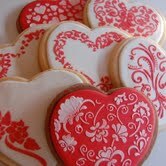 I’m excited to be able to offer the people of St. George and the surrounding area designer sugar cookies. Sugar cookies for every occasion – birthdays, weddings, baptisms, any occasion you can think of I can make you a special sugar cookie for that event. They also make unique gifts. The best part is that not only do the sugar cookies look good, but they taste even better. 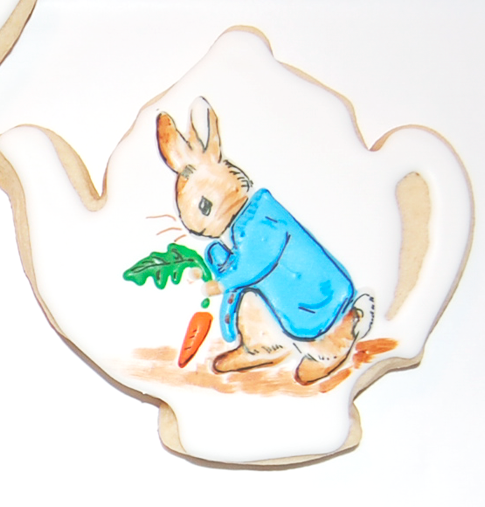 Keep checking back, I will be adding pictures of the different sugar cookie designs. For more information on how to order cookies please call me at 435-674-2778. I look forward to making St. George a more beautiful city one sugar cookie at a time. © 2012 Enchanted Cookie Boutique. All rights reserved.